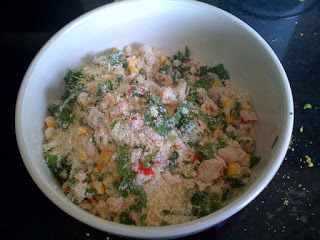 Story: Don't you love recipes that are quick, easy and tasty! This Rava Uttapam recipe is perfect for a weekday dinner or a lazy weekend brunch. My Mavashi (Mausi/Mom's sister) takes a practical and efficient approach to everything in life including cooking. Mavashi showed me how to make these uttapam a few years back.. and now Rava Uttapam has become a regular in my house. While we are talking about efficiency, whenever I make uttapam I use the Presto griddle to make as many as six uttapam at a time! I would highly recommend the griddle if you make dosas, uttapams, paranthas etc often enough. So feel free to spend some extra time with friends after work - a tasty uttapam meal is less than 30 minutes away! Mix everything except dahi/yogurt in a bowl. Adjust salt in the dry mixture as needed. Add yogurt/dahi till the mixture becomes soft. When it comes to this recipe more dahi is better than less .. so make sure the dry ingredients have soaked enough dahi. Keep this mixture covered for 5 ish minutes. Add water to get the consistency of pancake batter. 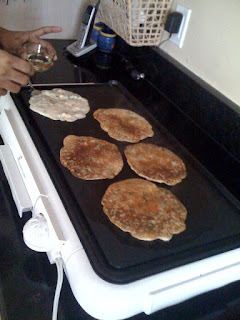 That's it - heat a non stick pan and make uttapam exactly like a pancake. Spread the batter in round shape and heat on one side till you get crispy texture and brown color. then heat on the other side for a couple of minutes to get a tasty uttapam! I'm beginning to realize that I usually read the story, and skip the recipe. well then .. I am glad I decided to write the stories :-). coincidentally someone at work made a similar comment today - I love the stories and the pictures... once in a while I read/use a recipe too. No matter where you learn the recipes from, your stories are always YOUR personal stories. Truly enjoyable. how many uttapam you were able to make using the above mentioned ingredients (same quantity) ? can you please include a "serving amount" in future recipes :-) (and if possible a recommended scalability factor) ... Thanx ! BTW Abhijit - that is good feedback about the serving size.. I will incorporate it for my future posts. hi ..tried this too..very delicious and cooking time is very less.Truly,perfect for a weekday dinner.